The new BMW Motorrad X2City is yet another fresh new face at the BMW Group in the segment of zero-emissions mobility on two wheels. The kick-scooter with electric auxiliary drive is light and compact and takes its rider where he wants to go regardless of traffic back-ups, shortage of parking space and public transport timetables. The X2City is classified as a “Pedelec25” requiring no helmet or driving licence for every one aged 14 and over. The new BMW Motorrad X2City is yet another fresh new face at the BMW Group in the segment of zero-emissions mobility on two wheels. The kick-scooter with electric auxiliary drive is light and compact and takes its rider where he wants to go regardless of traffic back-ups, shortage of parking space and public transport timetables. With a top speed of up to 25 km/h and an electric range of around 25 to 35 kilometres, the BMW Motorrad X2City is predestined for ever-more congested city traffic conditions. With this kick-scooter, BMW Motorrad is sending out another clear signal showing its commitment to developing sustainable and innovative solutions for the urban single-track mobility of the future. The X2City is classified as a “Pedelec25” requiring no helmet or driving licence for every one aged 14 and over. Light and compact. The BMW Motorrad X2City is ideally suited to all situations where individual mobility by car or public transport reaches its limits. It can be used as a stand-alone means of transport over short distances, or as a supplement to the car or to public transport – any combination is possible. Thanks to its low weight of 20 kilograms and the foldable steering unit, the BMW Motorrad X2City can be stored easily in the luggage compartment of a small car. It is ready to use after a few easy steps and can take its rider from parking space or city limits to the final destination inside the congested city centre. The compact dimensions of the BMW Motorrad X2City also make it easy to transport in the bus or on the underground – the ideal solution for spontaneous and comfortable mobility in areas not reachable by motorised means of transport. Fun and comfortable to ride thanks to electric auxiliary drive. Thanks to its compact dimensions, the BMW Motorrad X2City is even smaller than a foldable bicycle. In contrast to these, however, it also features an electric auxiliary drive in the rear wheel making it more comfortable and more fun to ride. The brushless hub motor provides effective support for the rider and accelerates the BMW Motorrad X2City to up to 25 km/h. The operating unit on the handlebars offers five speeds (8, 12, 16, 20 and 25 km/h). For safety reasons the supporting power of the electric motor is only activated once a speed of 6 km/h has been reached. The electric drive can be turned off at any time using a switch in the brake lever, thereby interrupting any electric support. Intelligent energy management. A 408 Wh lithium ion battery supplies the electric motor with power. It is contained in a rain and splash-proof housing underneath the running board and is integrated into the frame from where it can also be removed easily. 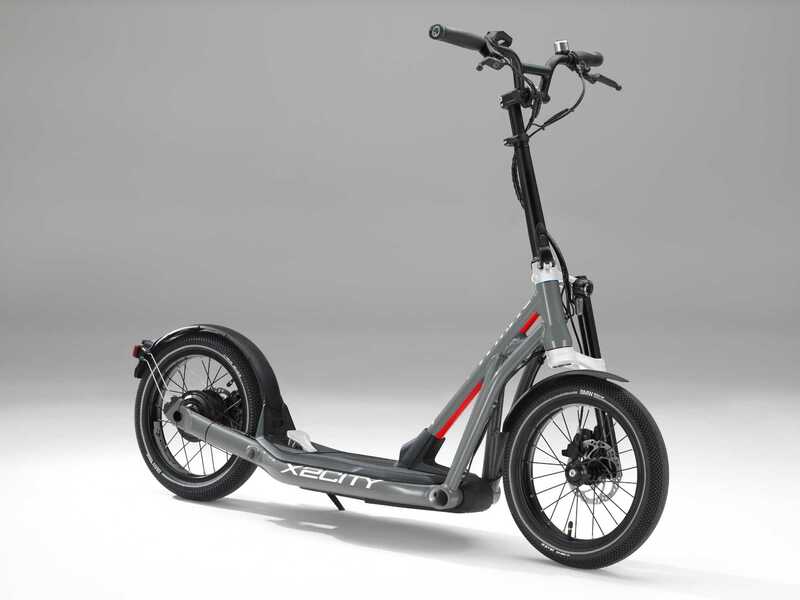 A battery management system with integrated power electronics ensures a range of between 25 – 35 km in everyday use. A specific charging unit with magnetic connector makes for easy charging using the exterior charging socket on the scooter or directly at the battery itself. The battery is charged using a conventional household socket and it takes approx. 2.5 hours to charge an empty battery. Perfectly harmonious riding properties. The big and wide wheels are equipped with robust pneumatic tyres, they provide excellent grip and ensure safe and comfortable riding even off the beaten track, which is especially useful when crossing uneven road surfaces, cobblestones or travelling on gravel paths. The rigid frame also safeguards agile and uncomplicated handling. For safe braking, the front and rear wheels are equipped with powerful and very responsive disc brakes. Both front and rear brake levers can be adjusted individually. The rider can also increase the dynamics and intensity of the brake response by shifting his centre of gravity. A brake light, which is integrated into the rear light, lets following traffic know when you are braking. High-grade components have been used in accordance with the BMW Motorrad claim to premium quality. The drive system including lithium ion battery has a 48 month warranty and is provided by Marquardt. The light units come from Supernova and the brakes from Magura. Of course all safety and lighting systems meet the Road Traffic Licensing Regulations (StVZO) for legal road use. Practical to use every day and very versatile. Thanks to the upright riding position, the BMW Motorrad X2City gives the rider an excellent all-round view of the traffic situation. Other road users can also see the rider very well. The low-slung running board and a telescope function in the scooter’s handlebar stem ensure perfect ergonomics allowing persons from 1.60 m to 1.90 m tall to use the BMW Motorrad X2City safely and comfortably. Spontaneous riding fun, versatility and zero emissions. The BMW Motorrad X2City covers the entire bandwidth of individual urban mobility for old and young alike. It is a great means of transport for travelling to school, to work or in your leisure time. It is a great and comfortable shopping or sight-seeing companion for urban areas, it generates no emissions and bypasses all time-consuming traffic jams. It’s also a fun means of transport on holiday and can be transported in campers or on a boat. The BMW Motorrad X2City riders needs no special clothing, but wearing a bicycle helmet is recommended for safety reasons. The BMW Motorrad X2City expands the world of urban mobility and is an attractive and emissions-free transport alternative.